Elsewhere Voltaire recalled that the old lady was shrivelled with black and yellow skin, "like a mummy". One can imagine his revulsion. There is good reason to suppose Ninon colluded with Voltaire's godfather in Voltaire's introduction to freethinking literature. According to Duvernet's Vie de Voltaire (1786) "Mlle Ninon asked the abbé de Châteauneuf one day for news of his godson. My dear friend, he replied, he has had a double baptism...for he is only three years old and already knows the Moïsade by heart". (p.11-12) It is a nice piece of banter and not one to be taken too literally. The Moïsade was a notorious deistic poem, which Voltaire certainly knew well in later years. More plausibly Duvernet tells us that, as a small child, Châteauneuf taught him to recite the fables of La Fontane by heart. The main source for Voltaire's description of the aged Ninon Lenclos is La défense de mon oncle a tract of 1767. Voltaire refutes his opponent's assertion that Ninon, like the Biblical Sarah, had been sexually attractive in advanced old age, and had counted among her lovers the ex-Jesuit the abbé Gédoyn, some fifty years her junior! The context encouraged exaggeration of her aged appearance, but no doubt there is an element of genuine memory. 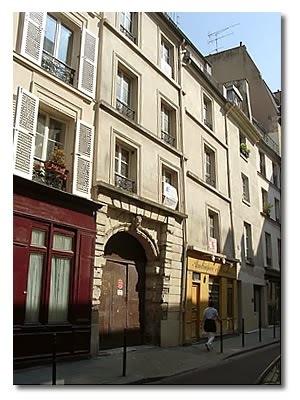 In 1701 Voltaire's father had acquired a house on the Île de la Cité overlooking the central courtyard of the Palais de Justice. Nicolas de Gédoyn, having been made a canon of the Sainte-Chapelle, moved into lodgings close by at about the same time. In my childhood I saw a lot of the abbé Gédouin the abbé de Châteauneuf, and of Mademoiselle l'Enclos; I can assure you that at the age of eighty her face bore the most hideous marks of old age, her body had all its infirmities, and she had in her mind the maxims of an austere philosophy. Scurrilous accounts of Ninon's latter day sexual exploits were, of course, legion; Voltaire himself repeated the story that she had succumbed to Châteauneuf's advances as a sixtieth (sometimes Voltaire has seventieth!) birthday present to herself. Maybe Voltaire heard as much from Châteauneuf himself; who knows, perhaps it was even true! 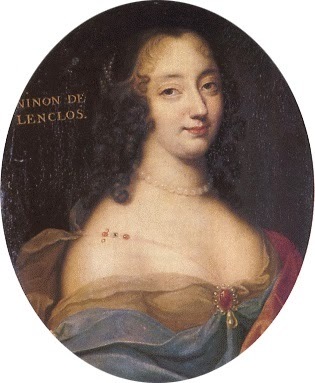 Ninon de Lenclos died peacefully on 17th October 1705. She passed away reconciled with the Church, surrounded by holy pictures having, a short time before, made her confession and taken communion at the nearby church of Saint-Paul-des-champs. This allowed her to be buried most respectably in the (now demolished ) church - under the floor, it is to be noted, NOT in the extensive adjoining cemetery.